Saturday, I put out another feeder on the deck. I was thinking we should get more birds out there. 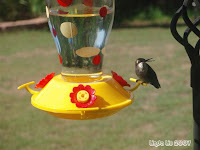 Lou was working over our new home and tried to install window screens, he called me and told me there were at least four or five hummingbirds near the feeder and fighting for the nectar. I feel so sad for these little angels (I love to call them angels). I thought I could get more feeders for each of them. I am not happy for the ones I got from Lowe’s. They are ok, but the design is not ideal. Sugar nectar comes out of the feeder and causes ants’ attack. I know I need to get another type of feeder. Left, is my second Hummingbird Feeder. It has a glass bottle with 6 feeding stations and a perching ring you can install underneath the base. It has a great appeal and it holds a lot of nectar and I think it would be great for these birds just before the migration. So I don't have to refill the bottle every few hours. The problem I found later after the first use was that it was hard to get cleaned. Especially the join between the glass bottle and the base. As you can see the place at where joins with lt's base curves 90 degree and that area tends to grow mold. No matter how hard I tried, I just could not clean that area. 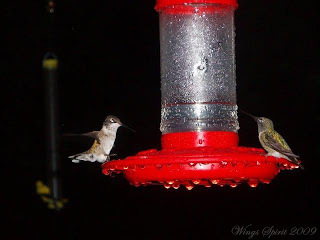 During the first winter in our new home, I left the feeder outside. It broke into pieces due to the freezing temperature. It left me no choice to look for a new feeder. 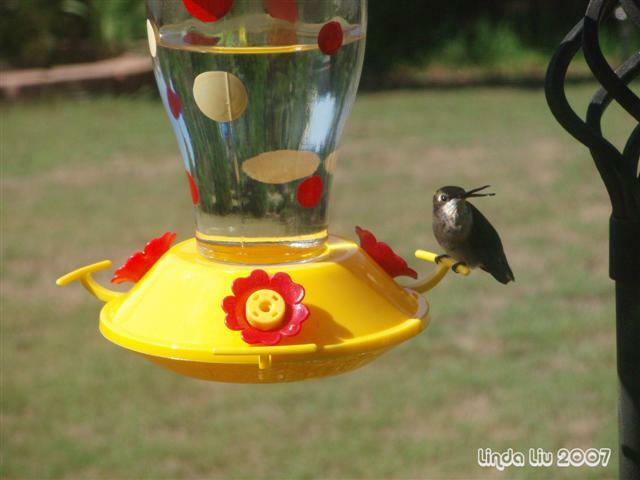 (Updated) Finally, I found this inexpensive (above), easy to refill and most importantly, easy to clean Hummingbird feeder from Wal-Mart. It has 10 feeding stations (it makes me wondering at the first why it has so many feeding stations. 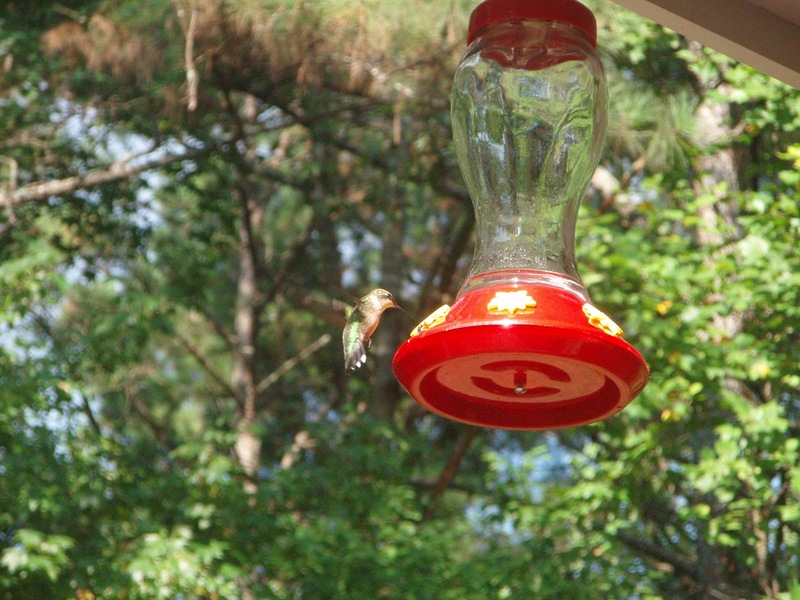 As we all know hummingbirds are territorial and they will chase other birds away from their feeders. It did not take me long to find out why). It is easy to assemble and disassemble for cleaning and it is non breakable. It is much smaller than my previous two nectar feeders (see pictures above). I find out it's advantageous to have smaller nectar feeders that make cleaning more easily. In a hot summer, it's recommended to clean the feeders at least every two or three days due to the hot weather can spoil your nectar. I don't buy commercially made nectar concentrate because sodium benzoate is added as preservative. I ask myself if I don't want my body to intake any preservative why should I feed my beloved birds with preservatives.